I recently located this vintage photo of the NPS Visitors Center. I am wondering how many of our readers remember this building. If you do, please leave a comment explaining where it was located. You might want to add what the building was originally used for, and tell a little about the boat in the photo. Also, does anyone have a guess about what year the photo was taken? This month's Ocracoke Newsletter is the entertaining story of Calvin Wilkerson and his Condomed Nautilus. You can read it here: https://www.villagecraftsmen.com/news042117.htm. Few people today know the story of John Augustin Daly (1838-1899), but in his day he dominated American theater. In addition to being a playwright and critic, he was a prominent theater manager who founded Daly's Theatre in New York City in 1879. 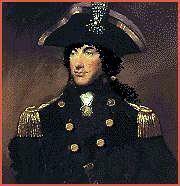 "Three weeks later a letter arrived telling of [Captain Daly's] death. It came from Captain Pike of Ocracoke, a small settlement at the inlet of the same name south of Cape Hatteras and situated upon the long sandy breastwork which forms the Atlantic coast of North Carolina and separates the waste of ocean from the inner waters known as Pamlico and Albemarle sounds. 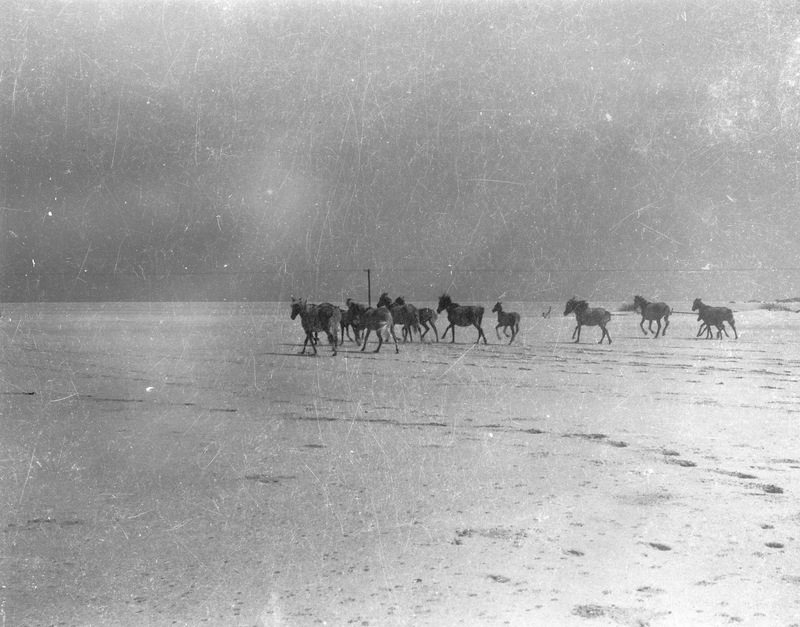 When detained by adverse winds or calms quite a fleet of outward bound vessels collects at the inlet, The coast had an evil reputation for wreckers and many stories were told of vessels lured on the breakers by false lights fastened to horses which were led up and down the sands. Upon receipt of the distressing communication our mother hastily left for Ocracoke taking with her a captain and two seamen for the Union as she was advised would be necessary. She set out with her infant son and a nurse by coach at four in the morning for Little Washington on Pamlico Sound, found a sloop ready to sail to Ocracoke, and reached it the same day. Captain Pike and his wife showed her every attention and gave her full particulars of all that had taken place. It was owing to light winds and calms that Captain Daly was three weeks in reaching Ocracoke from Plymouth. When his vessel arrived at the inlet he was found prostrated with fever and was taken ashore. Doctor Dudley of Portsmouth, twelve miles distant, was sent for but could not save him. He was interred in a plot set apart for burials in Captain Pike's garden. The ravages of wind and wave have devoured the shore line and buried the little cemetery beneath the waters of the Sound." Captain John Pike's home, store, and garden were located somewhere along the soundside shore in the vicinity of the present-day NPS Visitors Center and parking lot. 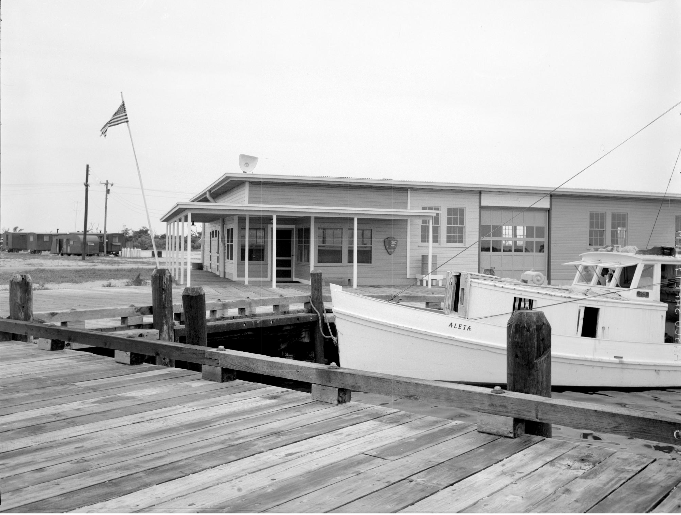 During WWII the US Navy established a base on Ocracoke. Earl O'Neal has written a comprehensive history of this time in his book, Ocracoke Island, Its People, the U.S. Coast Guard and Navy Base During World War II. On page 50 Earl includes the following photo of the Nettie B. Granville, a bugeye sailboat (a type of vessel originally produced in the Chesapeake Bay for oyster dredging) purchased by the Navy in 1942 for use as a freight boat. 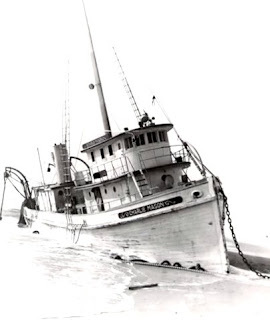 The Nettie B had been owned by Ocracoke Native, Stanley Wahab, who equipped the sailboat with a diesel engine. During the war the vessel was captained by Thurston Gaskill, another island native, who used the boat to haul freight and supplies for the Navy Base. 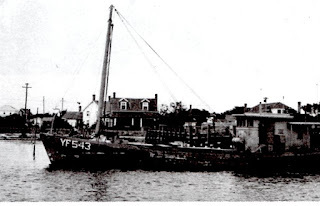 After the war Stanley Wahab, Thurston Gaskill, and Wahab Howard purchased the Nettie B, and used her as a freight boat for several years, bringing needed goods to Ocracoke village. "CHICAGO, Dec. 24. —A special to the "Tribune" from Norfolk, Va., says: The British steamship Ariosto, Captain Baines, bound from Galveston to Hamburg, was wrecked at 4 o'clock this morning, six miles south, off Hatteras, N. C, and twenty-one of the crew were drowned. Captain Baines and eight of the crew were saved by the heroic efforts of the Ocracoke life saving crew, under Captain James Howard. Those who lost their lives attempted to reach the shore in a small boat, which was swamped shortly after it put off from the ship. Captain Baines and the eight men remained aboard and were landed by the life savers in the breeches buoy, but not until after a struggle which lasted all day." 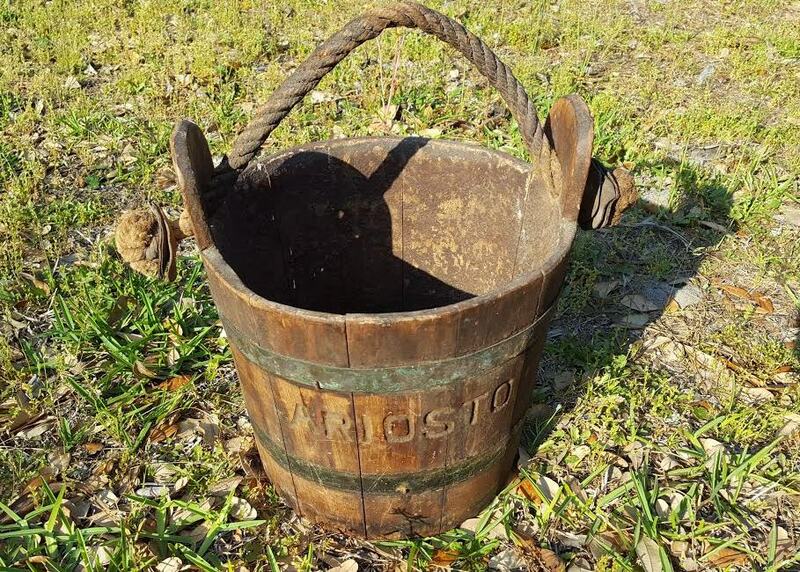 If you enlarge the photo you can clearly read the name, "Ariosto," carved into the bucket. Look for more about the wreck of the Ariosto in a future Ocracoke Newsletter. Dorcas is a name not heard very often today. But it was popular in the nineteenth century, especially on Ocracoke Island. At least six women on Ocracoke were named Dorcas. Dorcas, also called Tabitha (Dorcas is the Greek translation of the Aramaic word for gazelle), was a character in the New Testament who was devoted to good works and acts of charity (see the Acts of the Apostles, 9:36-42). Dorcas Societies are church-sponsored groups that provide clothing to the poor. One of the last Ocracoke women named Dorcas was my cousin, born 1962. Although she does not live on the island, she traces her family roots directly to William Howard, colonial owner of Ocracoke Island. Several years ago Dorcas and her husband were standing in line to purchase tickets for a recently released popular movie. The line was long, and moving very slowly. Impatient, her husband turned to her and said, "Do you really want to stand here any longer just to see this movie, Dorcas?" Hearing Dorcas' husband's comment, but never having heard the name before, a woman in front of them turned around, directed her steely gaze directly at Dorcas, and admonished her firmly: "I would not tolerate him speaking to me that way!" 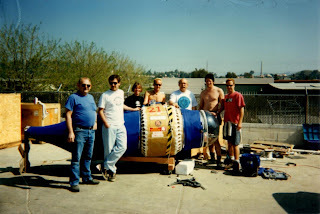 In April, 1996, Ocracoke resident Calvin Wilkerson entered the World Submarine Invitational, a human-powered submarine race in San Diego, CA, pitting design teams from around the world. Calvin's quirky submarine, using paint rollers to force water through 42 condoms, and dubbed the "Condomed Nautilus," competed against MIT, the University of Massachusetts, the University of California, and the U.S. Naval Academy, among other notable institutions. The first bus service connecting Ocracoke island and points north, including Norfolk, Virginia, was established in the late 1930s or early 1940s. 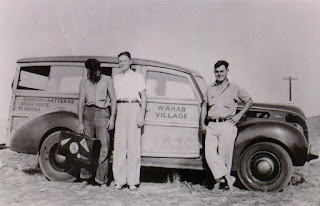 This is what Earl O'Neal writes in his book O'Neals of Ocracoke Island, their Ancestors and Descendants: "This bus was owned by Stanley Wahab to support his Wahab Village Hotel and other enterprises. It was operated by Van Henry O'Neal. Much of the time he picked people up at their homes, transported them to Hatteras Inlet Coast Guard Station [on the north end of Ocracoke], then carried the passengers on a small boat without the vehicle, to Oden's Dock in Cape Hatteras. From there you rode with the Midgetts, Anderson, Stockton or their dad to Manteo, NC, where they met the Trailways bus to Norfolk VA.... [T]here were no roads, only sand tracks, or if you were lucky and the tide was down, you got a smooth ride on the back of the beach along the edge of the ocean." Our latest Ocracoke Newsletter is the story of the Ocracoke Water Tank Caper. This is the link: http://www.villagecraftsmen.com/news032117.htm. In the mid-1800s the term "Lifeboat Man" (a sailor qualified to take charge of a lifeboat or life raft) was introduced into our vocabulary by the United States Life-Saving Service. Below is a photo of Ocracoke native George O'Neal's (1890-1968) "Certificate of Efficiency to Lifeboat Man." 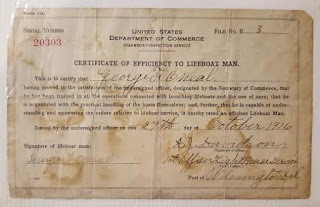 The certificate reads, "This is to certify that George F. O'Neal having proved to the satisfaction of the undersigned officer, designated by the Secretary of Commerce, that he has been trained in all the operations connected with launching lifeboats and the use of oars; that he is acquainted with the practical handling of the boats themselves; and, further, that he is capable of understanding and answering the orders relative to lifeboat service, is hereby rated an efficient Lifeboat Man." The certificate was issued October 27, 1916 in the port of Wilmington, Delaware. During the first half of the 20th century most young Ocracoke men moved to the northeast to work on dredges and tugboats on the Delaware River. Hence the certificate was issued in that state. Current information re. US Coast Guard requirements for Lifeboat Man is available here. As I was walking along the beach a few days ago I noticed this beautiful and intact sand dollar that had just washed up. Sand dollars are a type of flattened, burrowing sea urchins in the phylum of Echinodermata and order of Clypeasteroida. When alive they are covered in silky hairs called cilia. Sand dollars are fairly closely related to starfish. Sand dollars are rather common on our beaches. 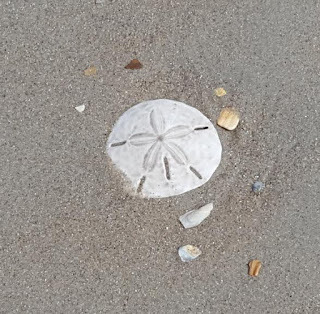 "The Legend of the Sand Dollar," which pairs various features of this echinoderm with the Easter story, is often sold along with sand dollars in coastal gift shops. Much has been written about the Ocracoke Brogue. On this blog I occasionally post examples of words, phrases, or grammar that are unique to the island. Linguists Walt Wolfram and Jeff Reaser have been documenting the Ocracoke Brogue for some time. Although outside influences weaken and threaten this unique dialect, it persists into the 21st century. 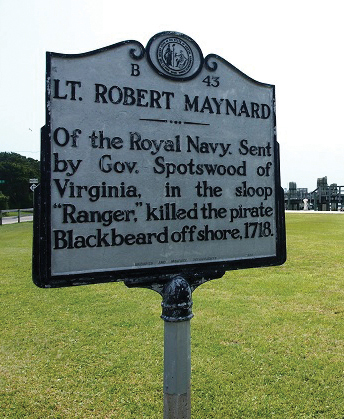 In addition, Wolfram and Reaser have preserved recordings of many Ocracoke natives. They also return to the island regularly to share their research with locals and visitors. Just this month sociolinguistics students from NC State University accompanied Wolfram and Reaser to the Ocracoke School to present their findings, and interact with local students. 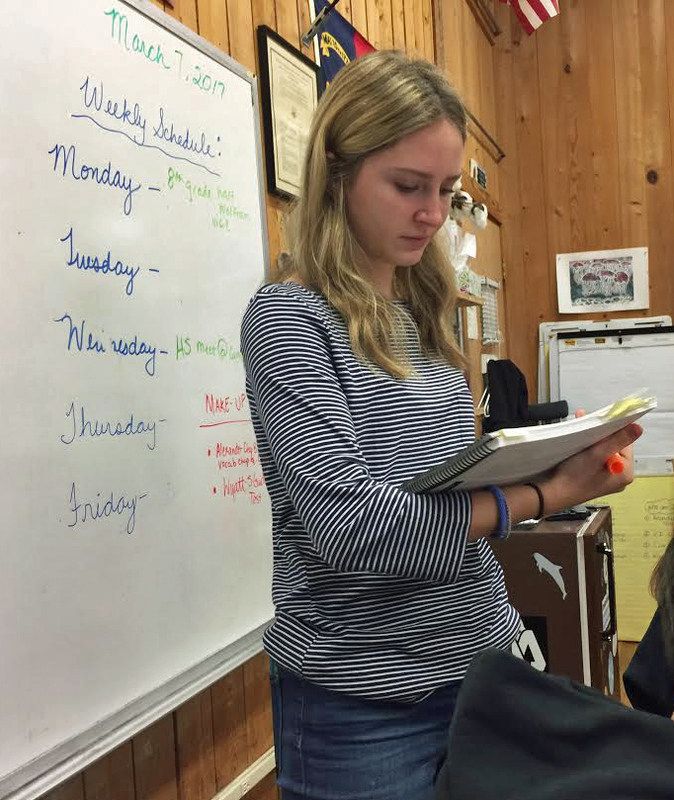 Interestingly, one of the NC State student linguists was Ocracoke native, Katie O'Neal. You can read about their recent visit here: https://ocracokeobserver.com/2017/04/12/ocracokes-hoi-toide-brogue-continues-to-fascinate/. 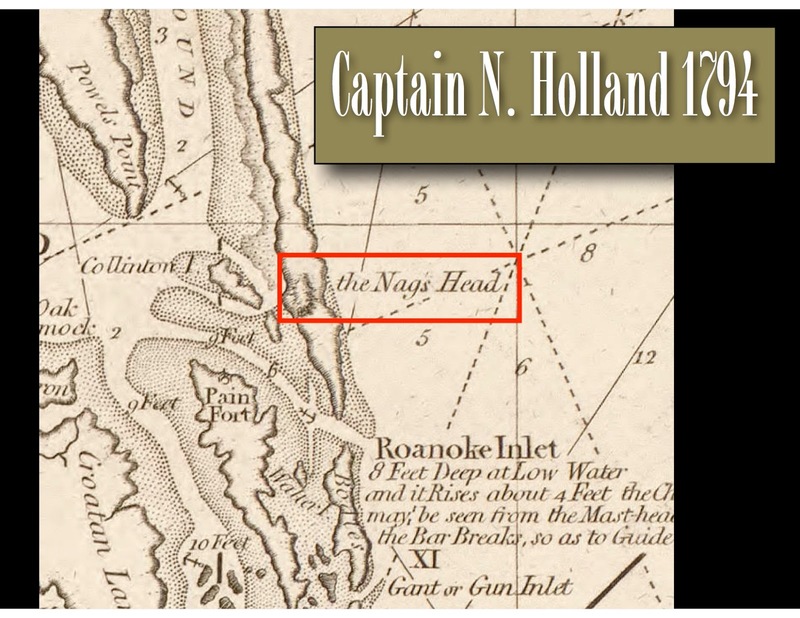 In November, 2016, I published a post about the origin of the Outer Banks name Nags Head. Although it is certain that the name does not derive from the activity of "wreckers" (unscrupulous bankers who would lure sailing vessels close to shore by tying lanterns around horses' heads or necks), I was uncertain where the name came from. "Contrary to the various urban legends, the name was first applied to the sand dune that is today Jockey’s Ridge. I discovered this some years ago and received David Stick’s endorsement that I was correct.... 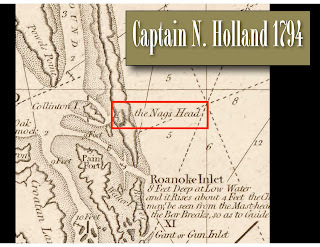 The 'Nags Head' was an abbreviation for 'Nags Headland' which appeared on a 1794 sea chart published by a Capt. N. Holland. On it you can clearly see the dune so identified. It was considered a headland because it was used as a navigational feature for coasting vessels." One of the Outer Banks' most celebrated pogey (or menhaden) boats was the Charlie Mason, a trawler which regularly supplied the Fish Meal Company in West Beaufort, NC, with menhaden. On January 1, 1948, the Charlie Mason, was fishing offshore of Ocracoke when the weather deteriorated. After getting the nets tangled in the propeller, the captain called the US Coast Guard for assistance. Shortly after getting a hawser secured to the stricken vessel, the line broke, and the vessel came ashore on Ocracoke's beach. Hatteras Islander, Charles Stowe, was among the Coast Guard crew who responded to the wreck. He penned a ballad, The Charlie Mason Pogey Boat, that tells the story of re-floating the trawler. Ocracoke native and musician, Martin Garrish, regularly performs this song. 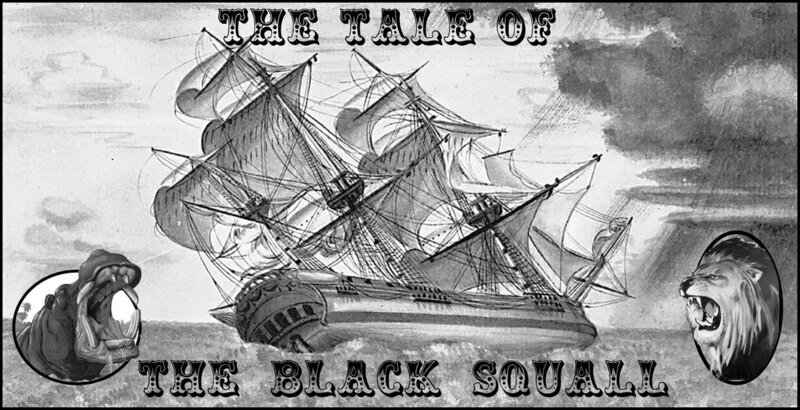 ﻿The 2017 Ocracoke Student Arts Partnership and Arts Week will tell the Tale of the wreck of the Black Squall on Ocracoke in 1861. 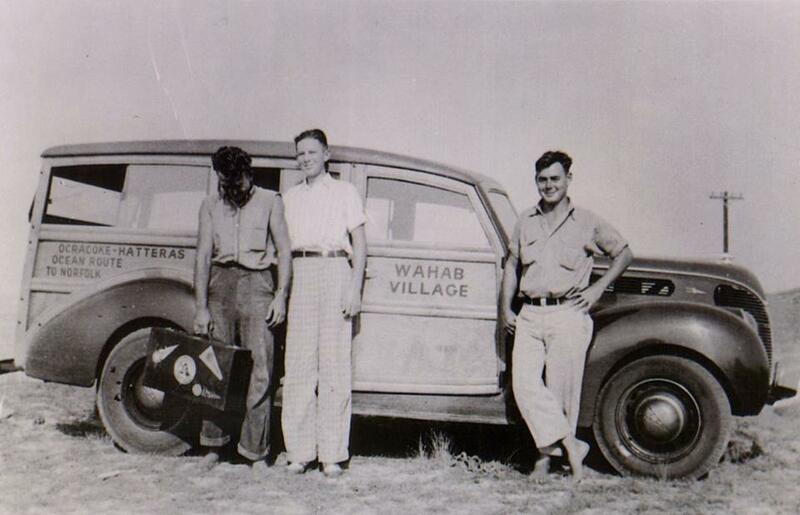 It's a fascinating story of a traveling circus that made an unplanned stop at Ocracoke Island. 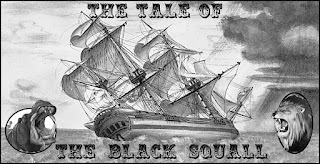 The activities and classes with these two programs will culminate in a student community performance of The Wreck of the Black Squall at 7 PM, Thursday, April 13 at the school gym. Both the Arts Partnership and Arts Week will include elements of performing arts from juggling and steel drums, to singing and tumbling. Each group of students, will have opportunities to showcase what they have learned as part of a retelling of this fascinating Ocracoke story. When the Black Squall wrecked off of Ocracoke Island in April of 1861, the storm washed ashore the remnants of a circus troupe, including giant tents, silk ribbons, dancing ponies, and a menagerie of animals. Walter Howard wrote an account of this wreck in the 1950s, as he learned it from Old Kade Williams, who was 17 in 1861. Nixon’s Circus, sometimes called Nixon’s Royal Circus and Menagerie of Living Animals, was en route from a performance in Havana, Cuba to Philadelphia, when it encountered a terrible storm. If you are on the island this week, be sure to come out to the school at 7 pm Thursday to see the performance. If you can't be there you might want to watch a video of Philip Howard telling the story. I just started reading Andrea Wulf's book, The Invention of Nature, Alexander Von Humboldt's New World. Although I haven't read very far yet, I noticed that Chapter 22 is titled "Art, Ecology and Nature, Ernst Haeckel and Humboldt." I was reminded of the sea life drawings of Ernst Haeckel (1834-1919), artist, biologist, and philosopher, who was inspired by the the works of Alexander von Humboldt (1769-1859), Prussian naturalist and Romantic philosopher. 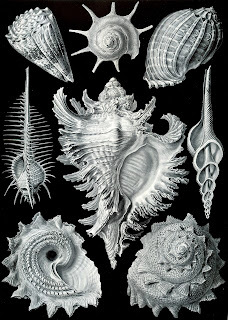 Although Haeckel's "Recapitulation Theory" (or "ontogeny recapitulates phylogeny"), the idea that organisms' embryological stages mirror their evolutionary development, and his racial theory (that different human races developed independently and in parallel) are widely discredited, his nature drawings are held in high regard. An internet image search will yield a fascinating selection of Haeckel's superb art. Enjoy! There will be a Makers Market on the shore of Silver Lake Harbor on April 15th from 9am - 3pm at the Wahab House Lawn, next to the Anchorage Inn. Local and regional vendors will be there, showcasing their products that include herb markers, coffee mugs, ceramic serving spoons, local coffee, leather purses, local watercolors, homemade granola, jewelry designed with porcelain made from china dinnerware, homemade soap, jams and local honey, and wall art. This is a free event. Bike or walk if you can, as there is limited parking. Parking is available at the NPS parking lot. In addition, island cooks are busy planning their best soups for the third annual Clam Chowder Cook-off Saturday, April 15, 2017, from 11:30 a.m. to 2:30 p.m. in the Ocracoke Community Center. Individuals, businesses, restaurants and professional cooks are poised to create their best version of traditional and/or non-traditional Ocracoke clam chowder. All proceeds benefit Ocracoke Child Care, Inc. Click here for more information. If you will be on the island be sure to check out the Makers Market and the Clam Chowder Cook-off! "Once I thanked God for my treasure, Now like rust it corrodes. And I can't help from blamin' your goin' On the coming, the coming of the roads"
The words above (from the song "The Coming of the Roads") were written by Billy Edd Wheeler (b. 1932). The tune was released in 1965 by Judy Collins (on Fifth Album). It is a sad song about loss of love and loss of a deep sense of place. Although the lyrics evoke images of "cool caverns" a "forest of green" and "the wild wood," the song has a more universal appeal. The coming of roads nearly always brings mixed blessings. Rural electrification, economic growth, improvements in health care, and greater educational opportunities...as well as traffic snarls, culture clashes, and environmental problems...often accompany the coming of roads. The National Park Service's 2005 Technical Report, Ethnohistorical Description of the Eight Villages Adjoining Cape Hatteras National Seashore and Interpretive Themes of History and Heritage, addresses the coming of roads on the Outer Banks: "The development of a paved road linking the villages of Hatteras Island preceded the establishment of the Cape Hatteras National Seashore in 1953. 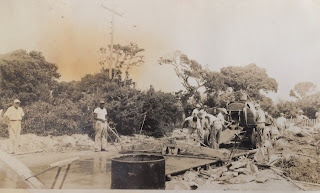 The road was built in sections starting with Hatteras to Avon in 1948, Avon to Rodanthe in 1950, and Rodanthe to the Oregon Inlet Ferry in 1952. This road was a significant catalyst for change. For example, its development led to the 1955 consolidation of small village schools into the Cape Hatteras School in Buxton. When the Oregon Inlet Bridge was completed in 1963, Hatteras Island was fully connected to the wider world, and this ushered in an era of tourism and development." The Navy paved the first road on Ocracoke in 1942. It was a one-lane concrete road connecting the Navy base to a series of ammunition dumps along present-day Cutting Sage Road and Trent Drive. The State paved most of the remaining roads in the village in the early 1950s, and laid down the road to Hatteras Inlet in 1957. The coming of the roads has brought tremendous changes to Ocracoke, some positive, some problematic. As always, our community continues to address inevitable changes in order to nurture all those qualities that make Ocracoke a unique and vibrant place to live, work, and enjoy life. In the past I have mentioned the broad tidal flat, almost entirely barren of vegetation, that extended from the present-day Variety Store to the current NPS campground. Ocracokers called it The Plains. Today this area is thick with yaupons, myrtles, and cedars. Pines and live oaks have even sprung up there in recent years. When the Park Service acquired Ocracoke in the mid-1950s they began construction of man-made dunes on the ocean side of NC Highway 12. This protected the newly paved road from tidal overwash, and allowed vegetation to flourish there. Present day visitors have difficulty imagining what Ocracoke looked like more than three-quarters of a century ago. I am re-posting the following vintage photograph to help our readers understand. "Ocracoke is a narrow island of beach sand, probably fifteen miles long and less than two miles across at its widest point. It is separated from the mainland by 30 miles of Pamlico Sound, and Europe lies 3,000 miles to the east across the Atlantic Ocean. The northerly half is covered with low sand dunes sparsely overgrown with a beach grass, a section south of the center is as flat and barren as a desert, and so low that the surf from the occasional severe storms washes over it into the sound." "[T]here was one particular case of a man with curative powers that seemed absolutely silly and preposterous, but his method, whatever it was, worked.... To give just one instance, the island has a growth called the sharp pointed rush [Juncus acutus]. It grows in low wet ground either in fresh or salt water. It reaches a height of three feet and is round and green and has a very sharp point. 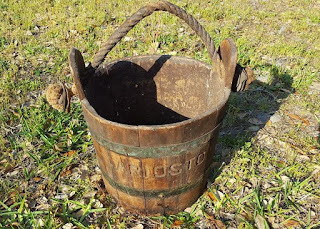 It doesn't seem to have any use whatsoever, but Jackson, as we'll call him here, found a use for it for a man who used to vacation on the island every summer until his passing on. This well-to-do gentleman, a banker from Washington, N.C., had an unsightly wart on his nose that was more than a half inch long and still growing. "The oddity of the rush is that the root end is white, round and soft, if you go close to the earth and pull the single rush out of its bed of roots slowly and easily, you have an all green growth except the white end. Jackson told the gentleman to pull a rush as mentioned above, and to rub the white part on his wart and place the rush back in the hole it came from and the wart would disappear before he'd realize what happened. The gentleman, Mr. Bridgeman, by name, pooh-poohed the idea but went through with the advice given him by Jackson, without telling anybody he had done so. 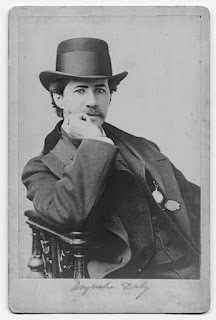 Mr. Bridgeman was staying at the home of my uncle, Winslow Sanderson Bragg, at which as a child I was then living. Uncle Winslow was staring at Mr. Bridgeman so hard that he quizzed my uncle, "What are you staring like that at me for?" "Feel your nose, your wart is gone," said Uncle Winslow. Then Mr. Bridgeman told my uncle what Jackson had told him to do, and how skeptical he was about doing it. "Mr. Bridgeman set out immediately to find Jackson and pay him for the favor he had done for him, but when he offered him money Jackson said "Oh my goodness, no; if I took money my gift would be gone." As it turns out, many natural ingredients may promote the removal of warts (at least according to Readers Digest) including garlic, dandelion, birch bark, and banana peel. According to Wikipedia, juncusol, a 9,10-dihydrophrenathrene which is found in Juncus species has antimicrobial properties. The next time you are plagued with a wart, consider rubbing it with the root of the sharp pointed rush. And don't forget to place the rush back in the hole it came from!! "We landed at the hotel pier and were shown a room. There probably isn’t another hotel like it in a thousand miles. Evidently starting with his little two story cottage, Capt. Bill Gaskill, by acting naturally and giving service to people who knew what they wanted has gradually expanded until he can now accommodate probably fifty guests. He specializes in sending out fishing parties, usually to the inlet with guide and bait and furnished bed, board and shelter for a fixed amount a day. Those preferring surf fishing are taken to the ocean beach on a truck. There are few formalities at Bill Gaskill’s – Bill is very apt to have a boat pulled up on the porch for repairs or painting at any time. 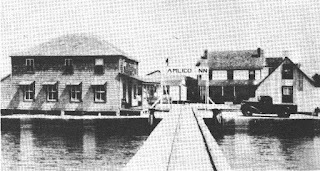 For conventional or formal persons who cannot leave the rattle-bang of the city behind, who are unhappy without stiff white collars, and cement pavements, and who must be amused by the movies or dance halls or night clubs, the Pamlico Inn cannot be recommended. But, to those who wish to leave our so-called higher civilization behind and get out into the sunshine on clean salt water with blue sky overhead, or tramp the wide sand beaches, Bill Gaskill’s place will appeal." In honor of National Poetry Month today we are publishing an original poem about Blackbeard and Lt. Robert Maynard by frequent Ocracoke visitor Robb Foster. That rendered sailors to their least? What next, these sailors cried, dismayed? Impugn this Governor Eden’s fraud! Who reigns our Carolina flawed! “You mark my words as I retire! Although I haven't mentioned it recently in this blog, I am guessing that most of our readers are aware of the NC Ferry Division's plans to establish passenger ferries from Hatteras to Ocracoke beginning in the spring of 2018. You can read more about this here and here. A crucial component of the plan is the addition of free tram service within Ocracoke village. However, the idea of a tram has raised numerous questions and concerns, primarily centered around logistics and traffic congestion, among island residents, . You can read more about that here and here. The latest wrinkle in the Passenger Ferry/Tram proposal is an announcement that the trams will use the latest autonomous automobile technology. Because Ocracoke village is small, contained, and has a slow speed limit, the NC Ferry Division has partnered with Google to employ the most advanced iteration of their pioneering self-driving vehicles for the trams that will carry visitors (and residents) around the village. A Google spokesperson was quoted as saying, "This is a stellar opportunity to demonstrate the feasibility of our groundbreaking technology. The self-driving trams will provide a valuable service to Ocracoke Island, and show the world how efficient and safe autonomous vehicles can be." Unfortunately, the recent accident involving an Uber self-driving vehicle, and Uber's decision to pull all of their autonomous cars off the streets, has concerned many Ocracoke residents. To read more about the latest developments in this plan, click here.